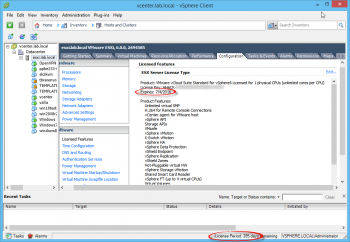 May 30 2015 Update - vSphere vCenter 6.0 license key is now available from EVALExperience, described below this original article. Jun 02 2015 Update - watch this conversation way down below for new arrivals expected tomorrow, presumably ESXi 6.0 license keys. 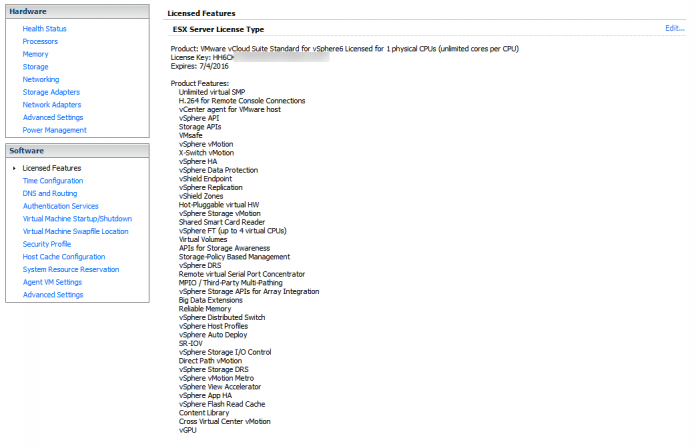 Jun 03 2015 Update - Good news, ESXi 6.0 can be licensed now too! Details way down below this article, with new video walk through too. Jan 05 2016 Update - Updated information about attempts to open a VMware Support ticket added at the end of this article. For me, it started with Mike Laverick's infamous, extremely popular post entitled "Bring back VMTN Subscription?" back in November of 2012, lamenting the loss of VMTN (VMware Technology Network). I even joined in on the thread, and bent the ear of every VMware employee I met back, way back at VMworld 2012. I had pretty much assumed this day would never arrive, when something roughly like the dearly departed VMTN would be reincarnated. Much like the MSDN or TechNet programs do for IT Professionals who work with Microsoft product, with varying levels of access to Microsoft's vast library of software. I've been blessed to be an MSDN subscriber since the late 1990s. You wanted VMTN back? 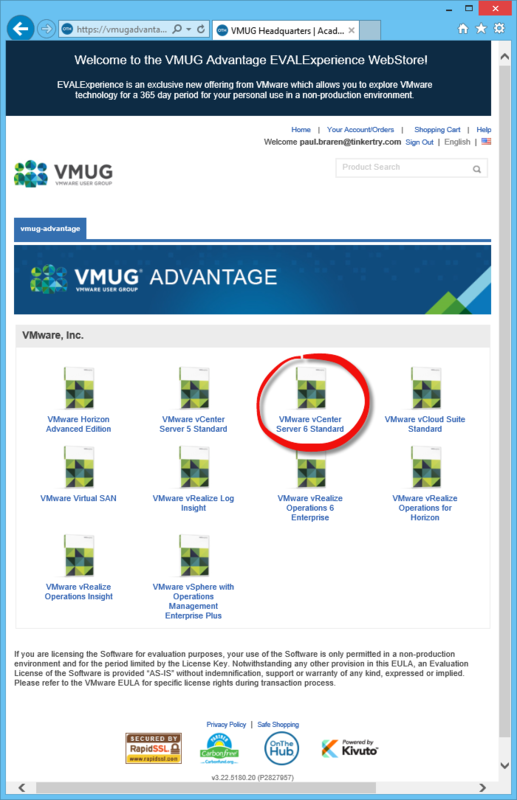 VMUG to the rescue! I can get to some 365 day licenses from VMware for free, from my day-job's corporate license, or as a vExpert. I've could also get "TinkerTry.com, LLC"! TinkerTry.com, LLC - EVALExperience order receipt a feature-limited Standard variant, at a cost of over a thousand dollars. But what's the fun in that? I prefer to learn my tinkering with my own gear, with access to ALL the features I need suited for a home lab environment. 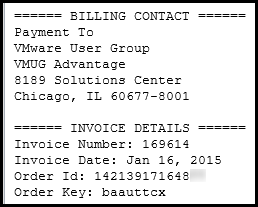 So I've gone ahead and paid my $200 USD anyway, for 1 year membership to VMUG Advantage. Partly just to see how the experience goes, and partly to avoid the dreaded, annoying 60 day full trial license time-bombs. Sure sounds about perfect for home labs with a single user, and just in time for Feb 2 2015's expected vSphere 6 announcement. Can you tell, I'm excited not just for me, but for many TinkerTry visitors who are also home lab enthusiasts? 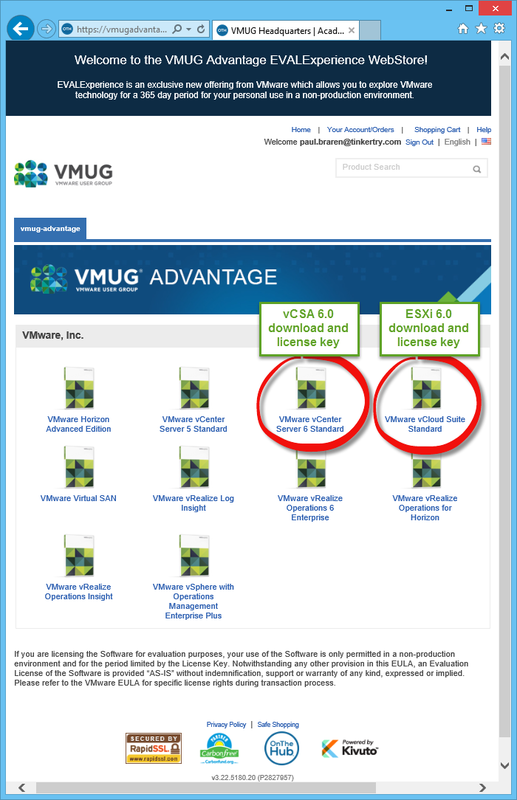 The licenses available to VMUG Advantage Subscribers are 365-day evaluation licenses that require a one-time, annual download. Annual product downloads ensure that Subscribers receive the most up-to-date versions of products. Here's some history of related articles, where you'll notice I had pretty much given up on the long wait. 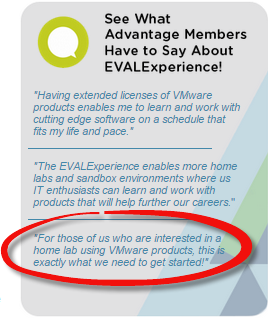 VMUG Voice newsletter arrived today, which highlights EVALExperience. You can view it here. It appears we may need to wait 2-3 weeks after vSphere 6 becomes generally available, before we'll know specifics about this program. See also comments below (thanks MoonDog), and the related post I put in Mike Laverick's legendarily-long thread here. I don't claim to have any official word on this, and if you learned something more, please let us know by dropping a comment below. Thank you! No more news on v6. We are just waiting for Vmware to give the go ahead. Awesome! Although admittedly it'd be awesomer had it come out less than 60 days from VMware vSphere 6.0 's March 12, 2015 release date. which I had frankly forgotten, since it was so long ago that I made the EVALExperience purchase seen at the top of this post. I'm still working on finding options for securing a 365 day EVALEXperience ESXi 6.0 license key, and I'll add my findings to this article. 2.4 Benchmarking. You may use the Software to conduct internal performance testing and benchmarking studies. You may only publish or otherwise distribute the results of such studies to third parties as follows: (a) if with respect to VMware’s Workstation or Fusion products, only if You provide a copy of Your study to benchmark@vmware.comprior to distribution; (b) if with respect to any other Software, only if VMware has reviewed and approved of the methodology, assumptions and other parameters of the study (please contact VMware at benchmark@vmware.comto request such review and approval) prior to such publication and distribution. 2.6 Open Source Software. Notwithstanding anything herein to the contrary, Open Source Software is licensed to You under such OSS’s own applicable license terms, which can be found in the open_source_licenses.txt file, the Documentation or as applicable, the corresponding source files for the Software available at www.vmware.com/download/open_source.html. These OSS license terms are consistent with the license granted in Section 2 (License Grant), and may contain additional rights benefiting You. The OSS license terms shall take precedence over this EULA to the extent that this EULA imposes greater restrictions on You than the applicable OSS license terms. To the extent the license for any Open Source Software requires VMware to make available to You the corresponding source code and/or modifications (the "Source Files"), You may obtain a copy of the applicable Source Files from VMware's website at www.vmware.com/download/open_source.htmlor by sending a written request, with Your name and address to: VMware, Inc., 3401 Hillview Avenue, Palo Alto, CA 94304, United States of America. All requests should clearly specify: Open Source Files Request, Attention: General Counsel. This offer to obtain a copy of the Source Files is valid for three years from the date You acquired this Software. ORDER. Your Order is subject to this EULA. No Orders are binding on VMware until accepted by VMware. Orders for Software are deemed to be accepted upon VMware’s delivery of the Software included in such Order. Orders issued to VMware do not have to be signed to be valid and enforceable. RECORDS AND AUDIT. During the License Term for Software and for two (2) years after its expiration or termination, You will maintain accurate records of Your use of the Software sufficient to show compliance with the terms of this EULA. During this period, VMware will have the right to audit Your use of the Software to confirm compliance with the terms of this EULA. That audit is subject to reasonable notice by VMware and will not unreasonably interfere with Your business activities. VMware may conduct no more than one (1) audit in any twelve (12) month period, and only during normal business hours. You will reasonably cooperate with VMware and any third party auditor and will, without prejudice to other rights of VMware, address any non-compliance identified by the audit by promptly paying additional fees. You will promptly reimburse VMware for all reasonable costs of the audit if the audit reveals either underpayment of more than five (5%) percent of the Software fees payable by You for the period audited, or that You have materially failed to maintain accurate records of Software use. SUPPORT AND SUBSCRIPTION SERVICES. Except as expressly specified in the Product Guide, VMware does not provide any support or subscription services for the Software under this EULA. You have no rights to any updates, upgrades or extensions or enhancements to the Software developed by VMware unless you separately purchase VMware support or subscription services. These support or subscription services are subject to the Support Services Terms. My contact tells me more downloads will be available tomorrow. In other words, we jumped in before the official launch. My, we are an eager bunch. Stay tuned! Meanwhile, see also Greg's comment below. Good news! 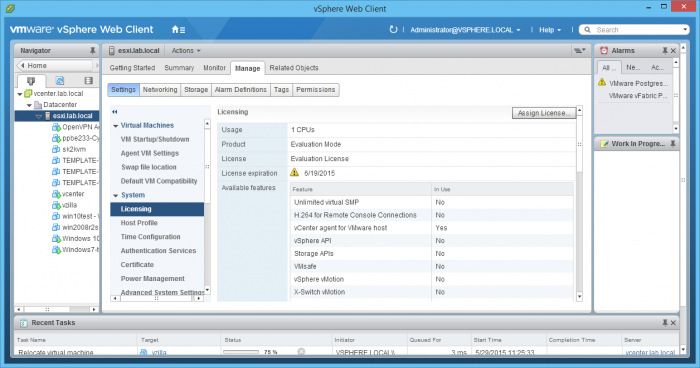 Simply choose "VMware vCloud Suite (English) - Download" and the license key you're given works fine with ESXi 6.0. Buy 12 months, and you get one free, so 13 months in all. About 400 days, it would seem. Nice! For me, it was May 29 2015 that I download and applied my VCSA/vCenter key, so July 04 2016 is exactly 402 days later. See also Greg from the VMUG organization, in the conversation below. I gather everybody who ordered EVALExperience before the vSphere release date is seeing the same expiration date I'm seeing, July 4, 2016, a day we Americans find easy to remember. I guess we're celebrating our independence from the fear of the 60 day time-bomb. Ok, that's a stretch, but trust me, licensing humor ain't easy. I also notice that my VCSA/vCenter 6.0 license expiration is the same July 4th as my ESXi 6.0 expiration. So, are you also seeing July 4, 2016 in your home lab? I'm curious, please drop your comments below, no login required. Thank you! Important to know that you cannot open a per-incident $300 service request ticket with EVALExperience license keys. I discovered this first-hand recently, as I talked to VMware Support about his. Instead, you'll need to purchase, at a minimum VMware vSphere Essentials Kit, with academic discounts likely your most affordable option. 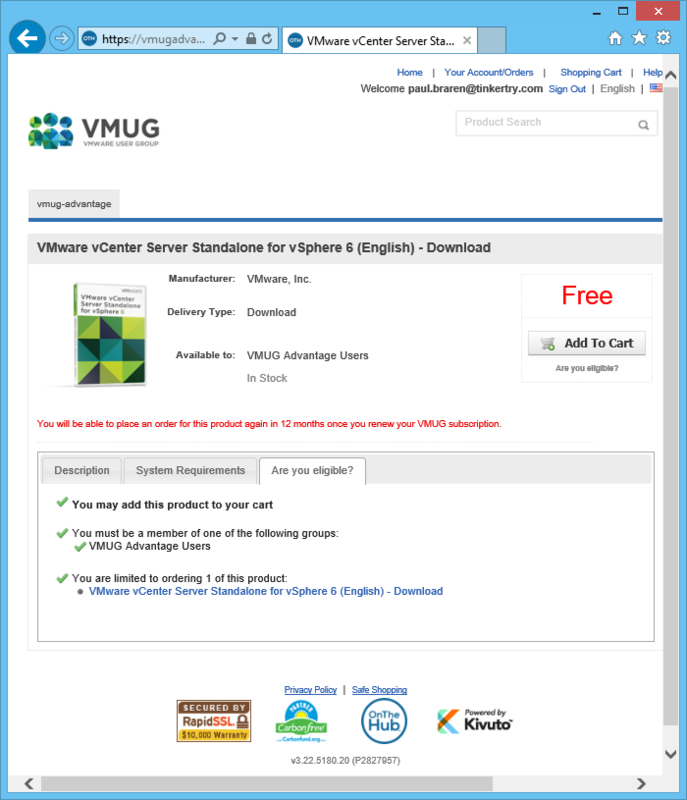 You can compare vSphere Editions here. 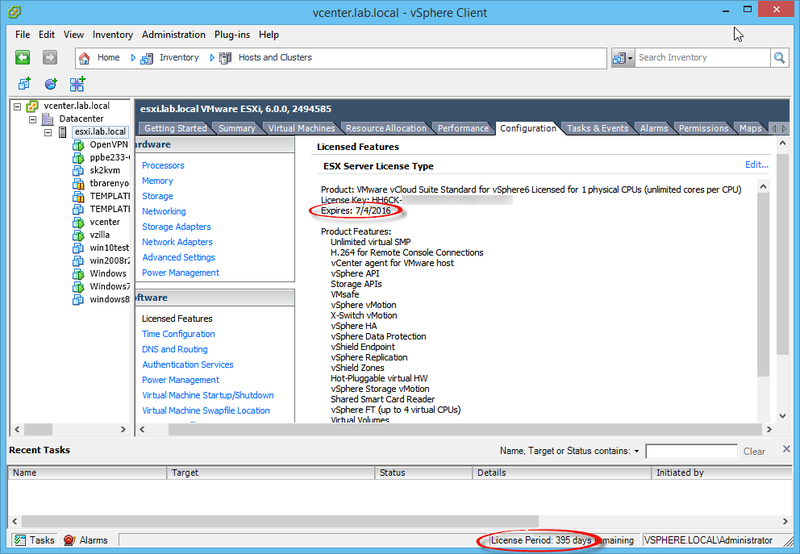 Once purchased, a key arrives that you apply to your existing ESXi host. Then you could open (and pay for) a per-incident service request.